Mouse anti Human HLA-alpha1 mAb90. Product is tested for Functional assay, ELISA (detection), Flow Cytometry. FACS, cell culture, ELISA capture (detecting antibody DDX0270). 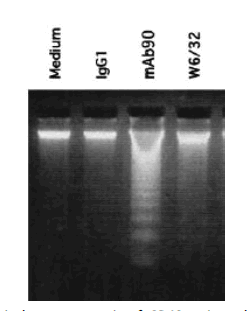 *This monoclonal antibody may be used between 1-20 μg/ml. Antibodies to HLA class I α1 domain trigger apoptosis of activated T-cells and also control the growth/survival of human B lymphocytes. Addition of mAb 90 strongly inhibits the proliferation of CD40- activated total tonsillar B cells, purified naive, germinal center and memory B-cell subsets. 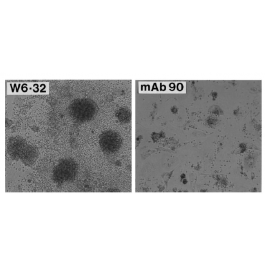 mAb 90 binds to an epitope of the α-1 domain of HLA class I heavy chain induces apoptotic cell death of activated but not resting peripheral T lymphocytes. (Genestier L. et al., 1997 Blood, 90, 726-35; Genestier L. et al. 1997, Blood, 90, 3629-3639). Genestier L, Meffre G, Garrone P, Pin JJ, Liu YJ, Banchereau J, et al. Antibodies to HLA class I alpha1 domain trigger apoptosis of CD40-activated human B lymphocytes. Blood. 1997 Jul 15;90(2):726-35. PubMed PMID: 9226173. Genestier L, Prigent AF, Paillot R, Quemeneur L, Durand I, Banchereau J, et al. Caspase-dependent ceramide production in Fas- and HLA class I-mediated peripheral T cell apoptosis. J Biol Chem. 1998 Feb 27;273(9):5060-6. PubMed PMID: 9478956. QMA Hyper D ion exchange chromatography.